EDIT: Giveaway is officially over. Congratulations to Eugenie Wu for submitting the randomly-chosen 799th entry. 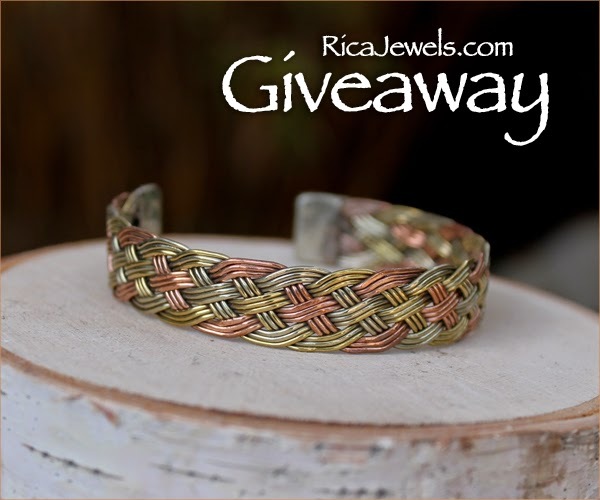 Rica Jewels will email you within 24 hours with instructions on how to claim your prize. The winds of March are making me wonder why I haven't learned to properly braid my hair yet. Not only would my tresses get less tangled, but there are so many pretty patterns available online now. The only braid style I ever mastered was how to make friendship bracelets back in the 1980s. Daniela of Rica Jewels offers a much more intricate braided bracelet called the Kusma Bracelet. The mixed metal bracelet is made with silver, bronze and copper. The beautiful bracelet is 7" long and 0.4" width and can be bent gently on the edges to better fit the winner's wrist. Yes, you read that right. Daniela's giving the above bracelet away to one of my readers! Rica Jewels has several marvelous metal and beaded bracelets for sale. Daniela received a bachelor’s degree in Fashion Design and knows how different people's wardrobes can be. That's why she's letting the winner choose one of three metal bracelet designs: Kusma Bracelet, Bisa Bracelet or Turquoise Twisted Cuff Bracelet. Use the Rafflecopter below to enter to win worldwide giveaway before 11:59pm EST on April 10, 2015. Be sure to leave the mandatory comment on the blog post with the same name you use to fill out the Rafflecopter - all entries by winner must be easily verified or a new winner will be chosen. http://www.ricajewels.com/shop/sterling-silver-hoops-rjea035 I love these earrings, they're simple yet detailed and elegant. Lupe Earrings are my favorite. The Narayani Necklace is beautiful. This bracelet really caught my eye - I love the combination of colours! Love the Aziza Necklace. Really beautiful jewelry. Thanks so much. I love the Talya Necklace. There is a lovely sterling braided necklace! Would love a necklace version of this bracelet too! I love the shaul spinning ring! What beautiful things! Love the Bangli Bracelet,it's perfect.thanks so very much for. I love the Biak Earrings. I love the Bangli Bracelet with Tiny Dots Forms Square. My favorite piece is the Bangli bracelet. Stunning! I love the Dina Pendant! The Kusma bracelet is gorgeous!!!!! I love the OM prayer bracelet. I love the Mandala Amethyst Pendant. My favorite item is Turquoise birthstone earrings with coral, Turquoise earrings, Birthstone earrings ,Turquoise with lapis earrings , Gypsy earrings RIEA075. My favorite is the turquoise ring. I love the Cukuh Ring. The turquoise Om Pendant is fabulous. J'aime beaucoup le " tree of live " pendentif. Would love that Kusma bracelet! This bracelet is beautiful would love to have it. My favorite piece is the Ammonite Pendant, I have always wanted one of these! I really like the Om Prayer bracelet. I love the Bangli bracelet! Bangli Bracelet is my favorite. The Bangli Bracelet looks good. this bracelet really looks beautiful. Nice deal. I love the Cukuh Ring!! I like the Noga Spinning Ring, Meditation Ring. I like Biak Earrings and Tree of Life necklace. LOVE the Bagmati Bracelet so much! I really like the Lupe earrings. The Jiri Bracelet is beautiful! I like the Mandala Amethyst Pendant. My favorite from the web site is the Bangli bracelet. I love the Masti Pendant. Thanks. Biak Earrings are my favorite. What unique pieces of jewellery. Beautiful! I love the Ketut Earrings! I love the Sterling Silver Hoops. I really like all the jewelry, but if I had to choose one it would be the spinning meditation ring. My favorite is the Rina Bracelet. And it is small enough to fit me! I like the lupe earrings. I love the Jiri Bracelet. I love the Madhu necklace. I really love the Leaves and Turquoise Cuff Bracelet. I love turquoise. I would choose the Bisa Bracelet. It's beautiful. awesome giveaway...love the spinning rings...so cool. I would choose the Blue Topaz earrings. I like the Rina Bracelet. I'd get that for my friend. Thanks for this giveaway! I absolutely love the Mechi Necklace! I adore the Athalia spinning meditation ring! If I only I had the money to buy these Lupe earrings right now! ilaria_carraro@libero.it plaese contact me here if i win! thanks! I like the "Kali Earrings". I think I would wear these a lot. I like that they are black, with a twist on a classic style. I really like the beautiful beaded Lumbini Bracelet in green. I love the Dov Ring. Wow!!! Amazing beautiful jewelry. It was so hard for me to just choose 1 item I loved. However, I really love the Bandipur Bracelets. Thanks for the chance! I heart the Usak ring! i like the Bagmati bracelet. I'm in love with the Seashell Pendant! So pretty! Love the Achara Earrings http://www.ricajewels.com/shop/e7nubgrp10abna41lcj0mqi0b4j8lv So very pretty!!!! I also like the Ari Pendant. Very beautiful. No wonder it's sold out. I love Natural Amazonite Faceted Rondelle! I like the Sinta Earrings. Everything on the site is so lovely! I would love to have the Garnet Leave Earrings, they are really beautiful. I would love to have the Jiri Bracelet. It is very pretty. I like the Arya Earrings and I think that it would look great on my wife. I love the Garnet Leave Earrings. I like the Kusma Bracelet. It reminds me of colored gold! The Fresh Water Pearl Bracelet is my favorite item. My wife loves pearl jewelry.